Product management (PM) functions as the glue that integrates the market, business and product domains of a company to deliver high-value customer experiences that drive customer success and shareholder value. PM is arguably among the most important functions in any technology company. INSTEP’s proven STO (strategy, tactics, operations) PM Model, depicted on the left, drives all of our PM services. Review PM Function: INSTEP routinely reviews and facilitates the improvement of the PM strategic, tactical and operations practices of an organization. PM reviews typically include PM organization structure and role definition; PM interfaces to internal and external stakeholders; PM processes, practices and tools used; customer success management. Significant attention is paid to the working relationship between PM and the development organization. Create PM Function: Many early-stage companies have to pivot from a founder acting in a PM capacity to creating a legitimate PM function. INSTEP routinely works with the executives of such companies to support the definition and creation of the PM function. This includes defining the PM organizational design, roles, processes, tools and practices using the PM STO Model (see image to left) as a guide. Market Analysis: INSTEP works with client executive management using a facilitated process to define, evaluate and select target markets using qualitative and quantitative techniques (size, accessibility, product fit, etc.). Competitive Analysis: INSTEP works with client management using a facilitated process to define and evaluate the competitive landscape for a product. The process begins with defining the key competitive factors to be evaluated and identifying the key competitors to be evaluated against the factors. In turn, each key competitor and the client product are evaluated against the factors and resulting insights are used to inform future product planning, new market expansion and strategic partnerships. Customer Analysis: INSTEP works with client product management staff using a facilitated process to discover and define attractive customer opportunities using the proven JTBD “Jobs to be Done” Framework. These tools are used to deeply understand customer problems and the opportunities they represent. The results of customer analysis include definitions of customer personas, pain points and value propositions. In turn new products or features are defined consistent with the results of this analysis are used to drive product development and customer success. Whole Product and Roadmap Definition: INSTEP staff routinely works with client PM staff to define whole products and associated roadmaps based on market/competitive analysis, customer discovery and technology trends. This includes defining the structure of the overall feature set (EPICS) and a prioritized set of functions (user stories) of a feature sufficient to drive development estimates and Sprint planning. Roadmaps are defined with high-level timelines for product release objectives made up of specific features. Overview of the PM STO Model: This two-hour course provides an overview of the INSTEP PM STO Model and highlights the key strategic, tactical and operational processes involved in product management. PM Strategy Processes: This one day course is highly interactive and takes attendees through the strategic processes of product management, including strategic analysis, target market strategy, whole product/partner strategy and business model strategy. 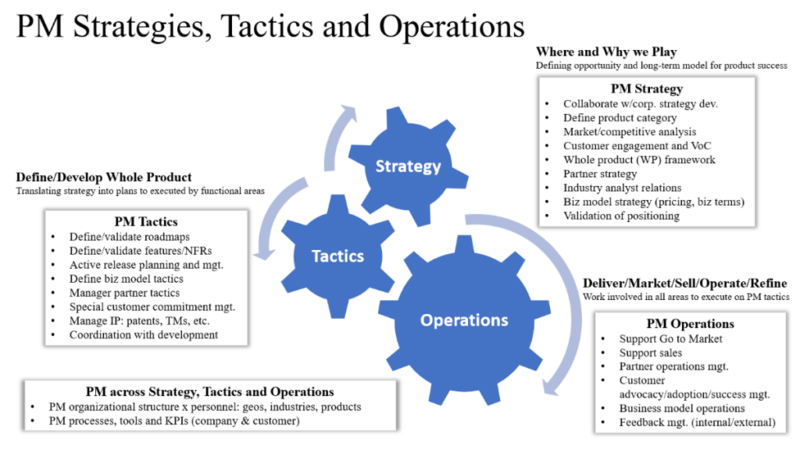 PM Tactical Processes: This one day course is highly interactive and takes attendees through the tactical processes of product management, including whole plan and partner planning, product release planning, “go to market” and “end of life” tactics as well as business model tactics. PM Operational Processes: This one day course is highly interactive and takes attendees through the operational processes of product management, including the role of PM in supporting the other business functions (sales, marketing, development, etc. ), customer and product metrics to track and act upon and feedback from operations to PM strategy and tactics.